There was talk on the Stitching Fingers Ning Group recently about using Gütermann polyester Sew-It-All thread as a fine thread in embroidery, and splitting it into two plies. Now, I’ve got a fair few spools of Sew-It-All in my box, and I knew for certain that they are a three-ply twist. The plies were very fragile spun threads which you’d be hard put to use for embroidery – they would simply break apart. Excellent sewing thread, but not something to break up and play around with for embroidery. 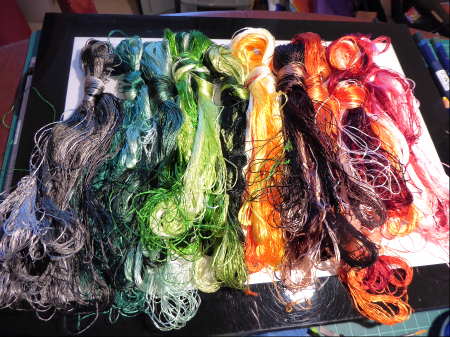 (I’d already tried, of course – I am a terror for taking threads and yarns to pieces to see what happens.) I commented that this was a three-ply thread you could not use split, on a Stitching Fingers forum. ‘No, no, it really is a 2-ply thread!’ people replied. 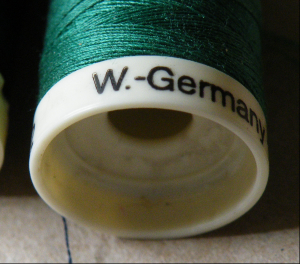 Puzzled, I tried Gütermann’s website and yes, it is listed as a two-ply thread, d tex 300/2 to be precise. So today I popped into our lovely local sewing shop, Watson & Thornton, and bought a couple of reels. Sew-It-All has changed dramatically since I last bought any. The green thread here is the old one – three fine, very fragile, spun plies. The navy blue is brand new: two plies (there’s a visible difference in the twist) and those plies are made of long filaments – much less fragile. Stitching with a single ply is perfectly possible, although it still needs fairly gentle handling. Two things come out of this discovery. Firstly, if you didn’t know that it has changed either, you wouldn’t realise that it’s now usable divided, as a very fine thread. (I’m not big fan of the feel and handle of polyester thread, but if you need to do teeny-tiny details, this thread is a useful option. It’s widely available, very good quality and comes in a very large range of repeatable colours.) 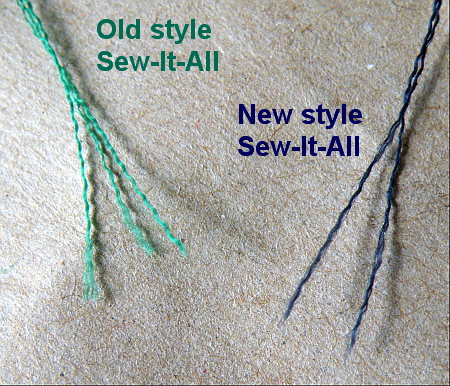 Secondly, if you want to split the thread for embroidery, you do need to make sure you’ve got the new kind not the old. I imagine that there are still shops with old stock around, particularly in less-popular colours, and you may – like me- have old spools knocking around the house. Don’t assume you can split those or you’ll be disappointed. Telling the old from the new is fairly easy. 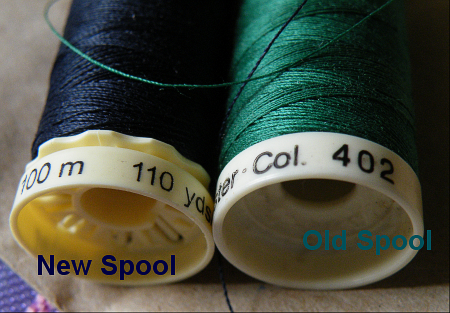 Old spools have the thread-winder at the top, new ones at the bottom. 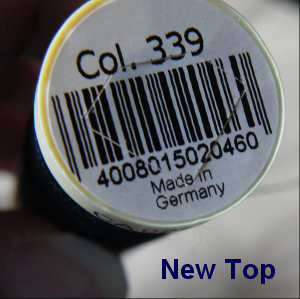 Old spools also have the colour number and place of manufacture at the bottom, new spools have these on the paper label at the top of the spool, with a bar code. One last clue, if it says ‘W. Germany’, like this one, it’s definitely been around for a few years! Before I go, a big hello and welcome to the new readers who have started following Tortoise Loft recently. I hope you’ll find my posts interesting. Don’t be afraid to make comments, ask questions and let me know if there’s any particular topic you’d like me to talk about. Has it really been over two months since the last time I updated this blog? I’ve been here and there. ‘There’ being a freezing-cold Bradford at Easter, for the annual national science fiction convention; ‘here’ being the day job out at Battlefield, and regular visits to my father in South Shropshire. I’m also doing some transcription work, which means more of my spare time has been spent right here at the keyboard. I’ve been doing this and that. 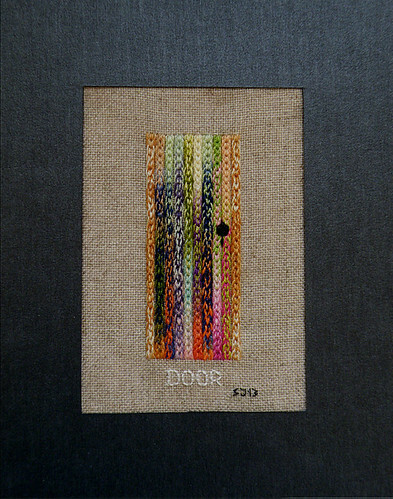 ‘This’, below, is a small piece stitched mainly in Hungarian braided chain stitch. 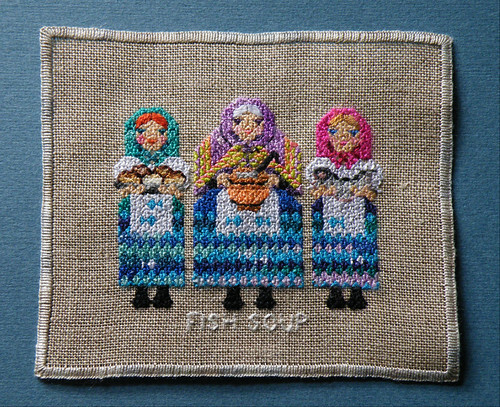 ‘That’, at the top of the page, is Fish Soup – a little picture worked in pineapple stitch: I was experimenting to see how the stitch could be used for the sort of stylised pictorial motifs normally worked in cross stitch. I designed Fish Soup to take advantage of some of the patterns that the stitches made naturally. It was surprisingly easy to stitch, once I had charted the design and I like the texture the pineapple stitch gives to the piece. I made both of these with some colourful thread which I bought from eBay (about which more in a moment). 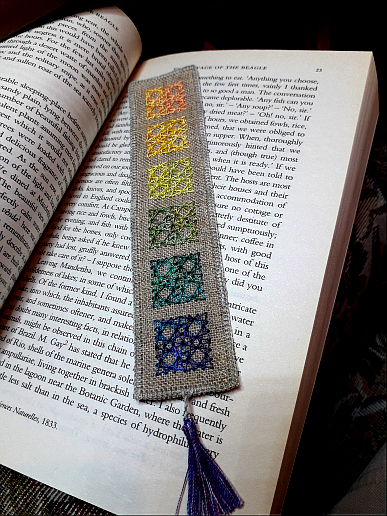 You may remember that I had given myself a ban on further needlework purchases, along with stationery and books until Easter. Well, the thread on this piece was where my resolve failed. I had been looking at this thread offer on eBay for several months, wondering if I should get it or not. I first bought some thread from eBay about a year ago. This was supposed to be “100% Pure Silk” but I thought it looked rather more like rayon in the photo. When it arrived, it was definitely rayon, very similar to Marlitt thread. Nice stuff – too nice to return for not being ‘as advertised’.